I just thought this was an interesting acronym that Amazon uses for selling unprofitable knick knacks. Sometimes, you see people buying stuff, lots of stuff, and it's not important--often, it's all a lot of junk. But they like to shop--bordering on shopsholics' compulsion. Maybe they don't even have a lot of money for this stuff. However, just the act of buying it--of having some control in their lives and some freedom of the purse--makes them feel good and buy and hoard more and more things. Likely it ends up in Goodwill, recyclables, the attic, or the trash. Who's Getting The Attention Now? I took this photo of this couple online in Starbucks this morning. It was very hard not to notice this guy's sneakers and socks (on the left). 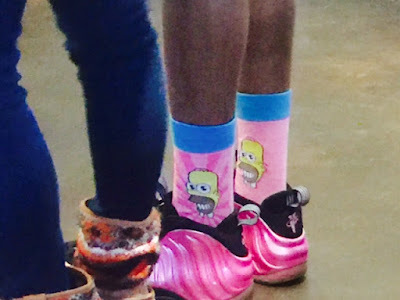 Hot pink sneakers with matching Homer Simpson pink socks. I thought to myself that you've got to be pretty bold to go out and wear that. It's funny how people love attention, and often it seems like they will say, wear, and act any which way they have to in order to get it. - It's valuable when your noticed (you become instantaneously cool, one to follow, maybe gets into the school or job you always wanted, oh and don't forget all the likes on Facebook or the paparazzi). - It feels good to have some (who wants to be ignored or looked down on? Positive attention is like an addictive drug to many people). - You can trade attention with others (they give you some and you give them some--it's like rubbing each others backs, but in this case it's your egos instead). - Perhaps, you can even save some up in the (memory) bank (where people remember what a great gal or guy you are). Think about what do you do to get attention and is it something you are proud of or are you acting a little mischievous, naughty, and outlandish to get it?